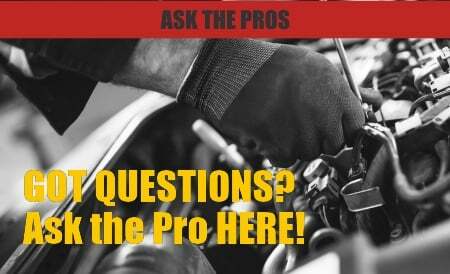 Red Angel A/C Stop Leak & Conditioner repairs common leak points in automotive A/C systems. Activated at the leak point only, Red Angel will not crystallize with existing oxygen or moisture in the system. After AC leak repair is achieved, Red Angel will continue to lubricate and condition working parts. Use Red Angel to fix AC leaks, for preventative maintenance, or to warranty hard part replacement against future leak points. Contains no solid or particulate matter that will clog the A/C system, or harm a recovery unit. Safe and Easy to use! For More Information, Please Visit: gobdp.com/products. It’s dependent on the size of your order. Please email distribution@gobdp.com to inquire. You definitely do not want to overcharge the system. The can of Red Angel A/C Stop Leak contains 2.5 ounces of R-134a. Red Angel will not harm or damage any shop equipment; we guarantee this. The product is reclaimed with the oil. Can I use r134 that has top leak in it as well such as ac pro? Will it interfere with red angel working effectively? We do not recommend mixing 2 stop leaks together within your A/C system. You should use regular R-134a (without stop leak) if you are adding Red Angel A/C Stop Leak to your A/C system. WHERE CAN I BUY THIS ONE WITH THE HOSE ALREADY ? Thank you for your interest in the Red Angel A/C Stop Leak & Conditioner. You can order the product directly on our website, http://store.gobdp.com/a-c-stop-leak-aerosol-00222/ . Feel free to contact our technical support line at 888-863-0426 with any questions. Can Red Angel be used in a hydrocarbon-filled system? I replaced the R-12 in my vehicle with Duracool 12a Hydrocarbon. I have a leak which I am unable to locate using a sniffer or dyes. Will Red Angel properly mix with Duracool? Yes, the Red Angel A/C Stop Leak (https://store.gobdp.com/a-c-stop-leak-49496/) is safe and compatible to use with Duracool. As long as the vehicle isn’t losing refrigerant too quickly, and the leak is not coming from the compressor, you would be a good candidate for the product. Thank you for your interest in the Red Angel A/C Stop Leak. Yes, we do ship internationally. You can order the product directly on our website, https://store.gobdp.com/a-c-stop-leak-aerosol-00222/. Simply complete the order checkout process and you will be prompted to enter your billing and shipping address. The Red Angel A/C Stop Leak (Aerosol can) is a one shot application, and contains 2.5 ounces of R-134a to give the system a partial charge, along with 2 ounces of the stop leak. 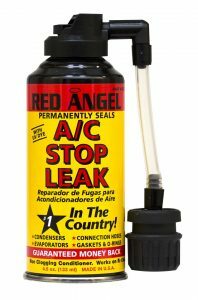 The Red Angel A/C Stop Leak (2 oz. bottle) does not contain any refrigerant, it is simply the stop leak additive. Feel free to contact our technical support line at 888-863-0426 with any other questions. One of the cans of Red Angel that you have purchased may have an older label on it. The contents of the two cans are identical. We have updated the product label a few times over the years. Is this product safe to be in the truck after using? Specially after using can a child be in the truck? And how long do I need to leave the truck on after using ? Activated at the leak point only, Red Angel will not crystalize with existing oxygen or moisture in the system. After repair is achieved, Red Angel will continue to lubricate and condition working parts. The product can be utilized as a repair, preventative maintenance or to warranty hard part replacement against future leak points. After the product is added (3-5 minutes), you may then top the system off with refrigerant. I have an ac 134a system that has completely leaked out its refrigerant. Would you recommend the bottle or can? How would you recommend the system be refilled along with your product. Also, can the bottle be poured in or does it need to be injected somehow. Using the Red Angel A/C Stop Leak (https://gobdp.com/product/ac-stop-leak/) would require the use of an oil injector to install the product. The Red Angel A/C Refrigerant Stop Leak (https://gobdp.com/product/ac-refrigerant-stop-leak/) is a one shot application, which comes with coupler to attach to the low side service port, and contains a partial charge of R-134a. With the use of either, you would add the product to the system once it has been evacuated. You may top it off with refrigerant after installing the Red Angel. My Car AC is Blowing Hot Air! 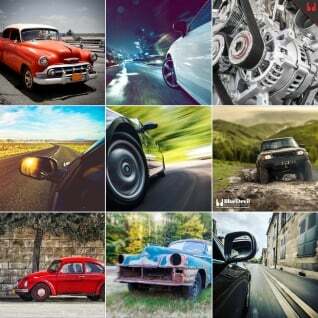 — What is the Best Windshield Wiper Fluid?